It’s hard to believe, but when Man of La Mancha was first conceived, it was a difficult sell. The show began as a television production in 1959 but without music and without its famous title. 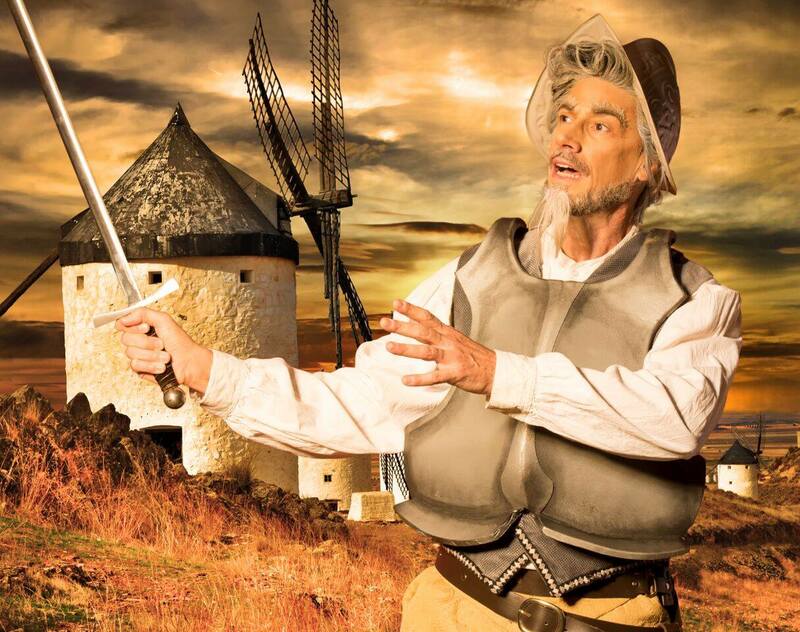 The sponsors didn’t like writer Dale Wasserman’s use of La Mancha incorporated in the name of a play, so it was changed to something considered more viewer friendly; I, Don Quixote. The music and lyrics came later, and so did Broadway, but not after some resistance. Considering what author Wasserman was up against, the musical’s theme of reaching that impossible dream became his own reality. Once the original title was back in place and the completed 1965 production with music and lyrics finally opened, it became a massive hit, acquiring seven Tony nominations and taking home five. On the 50th anniversary of that Broadway opening, Theater Works of Peoria premiered its 30th season at the Peoria Center for the Performing Arts with Wasserman’s dream, and now it has a problem. If anyone in the valley thought that maybe a theatre stretching a few miles north couldn’t possibly reach the professional standard of a Phoenix production, think again. 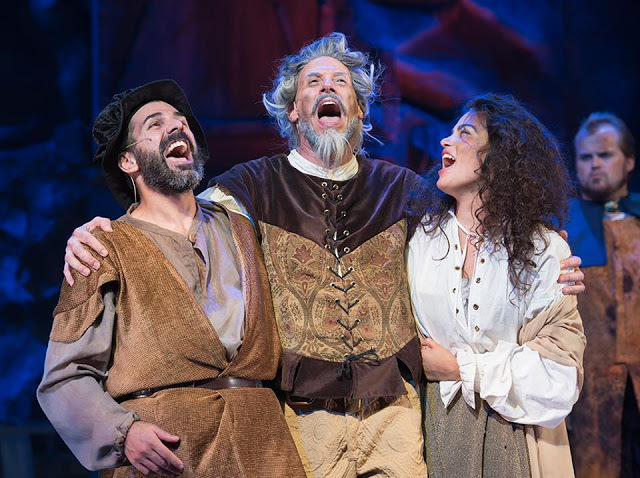 Under director D. Scott Withers’ guidance, Man of La Mancha is something quite wonderful. But here’s the problem: how will the theatre ever surpass it? The story of Don Quixote is one of those literature classics that most have heard of but few really know other than it has something to do with a skinny old man who thought he was a knight and chased windmills. As performed, Man of La Mancha has little resemblance in construct to the original Miquel de Cervantes novel, but its themes and characters are all there. The strength of Wasserman’s adaptation is that it is pure theatre. The show’s framework has a reality base. It’s the author himself, de Cervantes (a pitch perfect Rusty Ferracane) who finds himself arrested by the Spanish Inquisition and thrown in a dungeon, awaiting trial. Along with his manservant, whose real name we never know but will later become Sancho Panza (Rob Alloca), de Cervantes is ordered by his fellow prisoners to explain himself. In other words, he has a mock trial before his official one. The way the author explains his defense is to re-enact his cherished manuscript of an elderly gentleman who has essentially lost his mind and believes that he’s now a chivalrous knight on a quest to rid the world of injustices. The self described poet uses his manservant to tell the story. 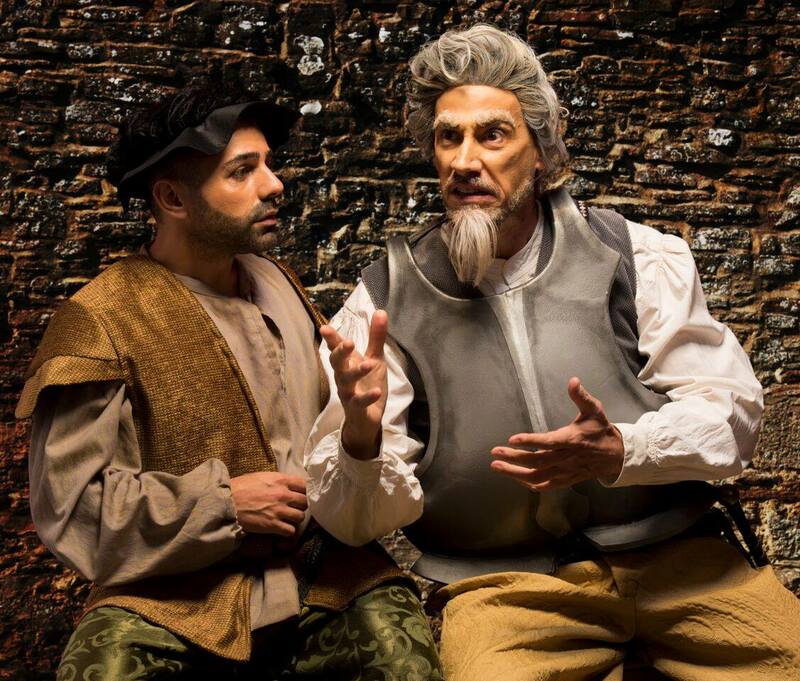 Suddenly, in a setting where all the world’s a stage, the dungeon becomes a theatre and all the prisoners are players as the curious story of Don Quixote de La Mancha unfolds. The first thing you’ll notice is scenic designer Brett Aiken’s dungeon. When lit by Jeff Davis’ atmospheric lighting design, Aiken’s superior set comes alive in a way where you can practically smell the dankness of an underground cavern. Throughout the production, the whole place is covered in a smoky haze. From an audience point of view it gives the construction a dreamlike quality where shafts of light stream from above down through the fog creating new worlds within its cavernous walls. Even though we never leave the confines of the dungeon, with the aid of lights, the haze and nearby props, the story within the story pushes our imagination to see an inn where the knight will later reside, a church confessional where members of the old man’s family (Brandi Bigley and Beth Anne Johnson) gather to talk to the Padre (Jeremie McCubbin) and eventually the old man’s bedroom. You can’t help but be impressed. The talented ensemble is continually on the move throughout, doubling as prisoners and various other supporting players as the story within a story develops. Katrina Sanders’ creative and energetic choreography keeps the proceedings lively, using all available space to express movement and, through mime and props, even creates the illusion of horses on stage. But it’s the four leads that truly impress. 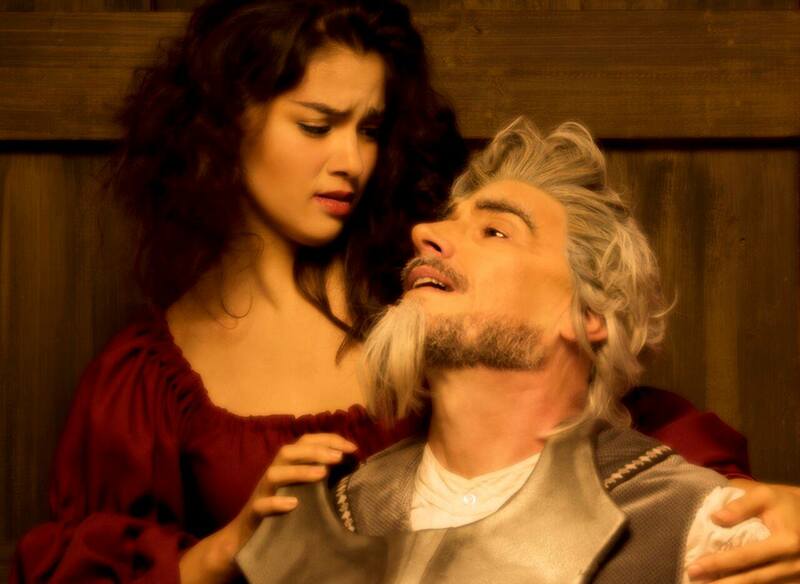 Rob Alloca injects humor and a sense of playful fun as Sancho. Scenic designer Brett Aiken does double duty as the Duke delivering a surprisingly commanding presence as “… A man who carries his self-importance as if afraid of breaking it.” Janine Colletti makes a handsome Aldonza, though curiously her singing voice is occasionally at odds with her speaking voice. Classically trained, it’s possible that her operatic style is not always ideal for this particular style of score, though later when she reprises Dulcinea by the old gentleman’s bedside, the moment is both sweet and touchingly sincere, and it’s Colletti’s voice that makes it so. And that brings us to Rusty Ferracane who time and time again has delivered a standard of performance in valley theaters that rarely fails to elevate an okay production into something quite special. Here as Don Quixote, Ferracane has a role tailor made to both his tall, lean, angular appearance and to his outstanding singing voice. The Impossible Dream is the show-stopper you want, but there’s something more. Author Wasserman gave his de Cervantes a glorious speech describing life as it should be and not as it is, and Ferracane delivers it with all the deepest, heartfelt emotion the moment requires. Don’t be surprised if you’re suddenly reduced to tears. It’s that good. The show runs for a 100 minutes without intermission, which is just as it should be. Once the plot is in motion, a break in the middle would be nothing short of an annoying interruption. By keeping the momentum continually on the move, the production creates a sense of urgency to the proceedings as de Cervantes attempts to complete his defense before the threatening presence of the Inquisition lowers the staircase and takes him away to face his real trial. Production credits are all of a high standard, from Tamara Treat’s costumes, Jacob Hamilton’s hair and make-up design, Matthew Sanders’ atmospheric sound, to Steve Hildebrand’s thrilling music direction. This is one Theater Works production that inspires the notion that the impossible dream, no matter how hopeless, no matter how far, is truly reachable after all.